Star Wars: The Force Awakens: The Village People! As always if you do not want to be spoiled on the details of Star Wars: The Force Awakens, stop reading now. Also make sure you do not openly discuss these details in public forums unless they’re marked “Spoilers.” If someone on Twitter follows me and you, they will see what you’re writing and just because they follow MakingStarWars.net doesn’t mean they read spoilers. So be cool! Today we will do a little house cleaning, talking about the first thirty tiny moments of the film at the village. I received a lot of requests for clarification and everything we know of the Vicar. Every day someone asks me if its Max von Sydow’s character. To the best of our knowledge, Sydow is playing the Vicar in these sequences. Some of this won’t be news. Some of it will be elaboration. 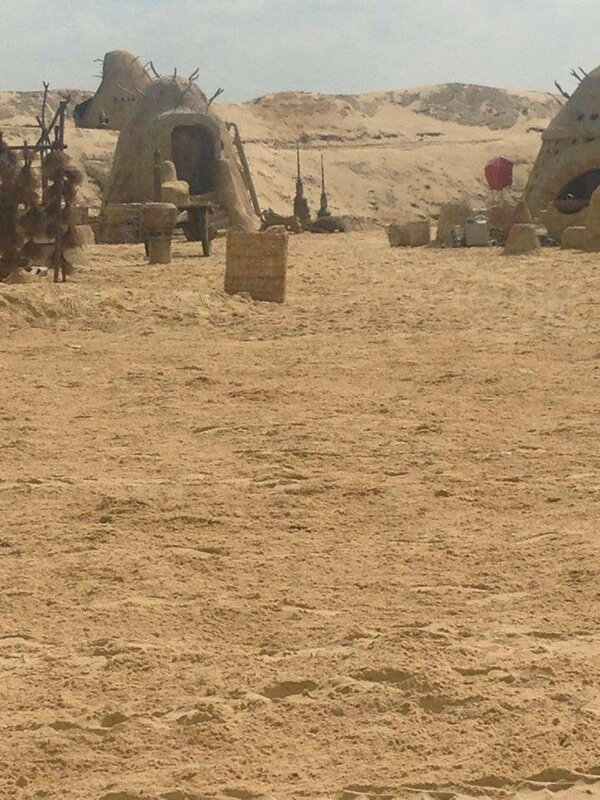 This is nearly the first thirty shots of the Star Wars: The Force Awakens. The X-wing mentioned is the one from the Force for Change video (gray with blue highlights). 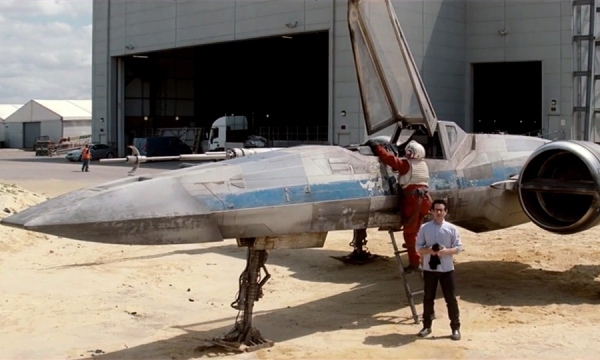 Poe’s black X-wing comes later in the film. Exterior Night-Space/Savannah A lightsaber tumbles through space, crashes towards the ground. Exterior Day-Savannah Lightsaber lands – dawn into day – a strange hand appears. Exterior Night- Outskirts of Village BB-8 is troubled by something coming and hurries off. Exterior Night – The Village BB-8 pushes towards the vicarage. Interior-Night – The Village Vicarage Vicar hands over the lightsaber. Poe is grateful, BB-8 rolls in. Exterior Night – The Village Vicarage Poe sees Imperial Transports approach. Vicar tells Poe to go. Exterior Night – Village Poe and BB-8 rush through the village as residents prepare for battle. Exterior Night – Rise near village/X-wing Poe gets his ride ready, BB-8 too. Poe sends message. Exterior – Night – Village Imperial Transports land; Stormtroopers get into disagreement with villagers. Interior – Night Village – Stormtrooper Transport Finn and Stormtroopers leave the transport under fire. Exterior – Night Rise Near near village/X-wing Poe sends message, sees another Imperial arrive. Exterior – Night – The Village A huge Imperial shuttle lands beside the Stromtrooper transports. Exterior – Night – The Village Vicar watches Flamethrower Stormtroopers. Finn spares a villager. Kylo Ren arrives. Exterior – Night Village/X-wing Poe watches Kylo Ren’s arrival from a distance. Exterior – Night The Village Vicarage Kylo Ren confronts the Vicar. Exterior – Night The Village/X-wing Poe watches the confrontation and BB-8 wants to get moving. Exterior – Night- The Village – Vicarage Kylo Ren out is out of patience, says “goodbye” to the Vicar. Exterior – Night – Rise Near Village/X-wing Poe sees sudden end, hides lightsaber in BB-8. They go their separate ways. Exterior – Night – Village/X-wing Stormtroopers make a mess of Poe’s X-wing. Exterior – Night – Outskirts of Village (Desert Location) BB-8 watches as Stormtroopers depart, huge fireball. CG Exterior – Night – Star Destroyer in the Distance Imperial Troop Transporters and Kylo Ren’s shuttle head for the Star Destroyer. It looks the the Vicar in the Vicarage to me. Directly after these sequences, Poe and Finn are aboard the Star Destroyer. The pair then end up on the surface. We then meet Rey and they steal the Falcon. After their flight, they end up meeting the owners of the Falcon. It is not until the flashback sequence that we learn the “strange hand” is Naka’s hand.